If you’re looking to meet fire retardant (FR) requirements which demand the elimination of brominated fire retardant additives such as decaBDE or meet new FR requirements such as reduced peak heat release rates in high density polyethylene injection molded parts, Contact Us today. Huber’s unsurpassed technical expertise is its foundation in developing innovative fire retardant additives that meet your exacting requirements. Our team of highly-skilled technical experts will assist you in reformulating your compounds to meet constantly changing FR requirements. 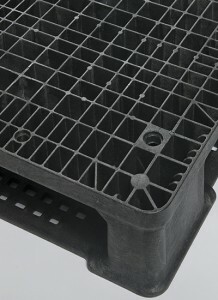 We have extensive knowledge about the use of non-halogen flame retardants in a wide variety of injection molded parts, including shipping pallets, laundry carts and rubbish containers. Magnesium hydroxide (MDH) is an excellent fire retardant for injection molding applications as its thermal decomposition temperature is >320°C, thus offering the user a greater degree of freedom when selecting optimal processing temperatures. Huber’s Vertex® 60 SV surface modified MDH is the perfect choice to replace halogenated flame retardants such as decaBDE. The unique particle size distribution combined with the proprietary surface treatment of Vertex® 60 SV provides excellent processing, FR and mechanical property performance when used in high density polyethylene compounds. Some of the benefits include lower viscosities at higher shear rates, reduced heat release and flame spread rates and higher impact strengths as compared to typical decaBDE filled compounds. If you are looking for a halogen-free replacement for your injection molded part that will meet regulatory demands, improve product performance and be cost effective, look no further as we’ve got your solution – Huber’s Vertex® 60 SV MDH. We are looking forward to working with you.